Digital technology was supposed to usher in a new age of distributed prosperity, but so far it has been used to put industrial capitalism on steroids. It's not technology's fault but that of an extractive, growth-driven economic operating system that has reached the limits of its ability to serve anyone, rich or poor, human or corporate. Robots threaten our jobs while algorithms drain our portfolios. But there must be a better response to the lopsided returns of the digital economy than to throw rocks at the shuttle buses carrying Google employees to their jobs, as protesters did in December 2013. In this groundbreaking book, acclaimed media scholar and technology author Douglas Rushkoff calls on us to abandon the monopolist, winner-takes-all values we are unwittingly embedding into the digital economy and to embrace the more distributed possibilities of these platforms. He shows how we can optimize every aspect of the economy - from central currency and debt to corporations and labor - to create sustainable prosperity for business and people alike. The author should have backed up his assertions about the roots of capitalism and wealth disparity with specific historic and economic data. Some of his claims about power law distributions not cropping up in more community-based systems are demonstrably false. Power laws are ubiquitous across nature and society, and arise due to naturally-occurring feedback loops in systems which grow via aggregation. What three words best describe Douglas Rushkoff’s performance? It addresses important questions about the societal benefits of grow-or-die capitalism, but misattributes the causes and solutions. A lot of pan-industry pan-economic generalisations... although woven in to sometimes useful to know and quite fresh talk tracks. Not too many statistics... Nice historical references, connected to subject of the book... I read Douglas before (read Cyberia back in beginning of 1999 or so) and it was the same style. Excellent and thorough presentation on how wealth gets concentrated into the hands of the few, and some interesting ideas on how we can, in our current business and technical climate, begin to unravel this and create more widely held prosperity. Be prepared for a long listen, he covers a lot of ground. Could easily be two books! Rushkoff avoids the dread "S" and "C" words (for the most part), while giving an interesting take on the problems of a capitalist society in the digital age. Rushkoff tells a story about his friend who co-founded Twitter. This story is meant to illustrate the systemic dangers of elevating growth as the highest priority in business. The problem is that no one forced the owners of Twitter to go public. The "system" didn't do that, the owners of Twitter did that. They could have easily kept Twitter as a private company that remained as disruptive as ever. There are many companies that do this. The founders of Twitter, instead, chose to go for the fast money and made deals with Wall Street bankers that necessitated the transformation of Twitter into a public behemoth that has to grow at all cost. The system is not the problem; the personal greed of Twitter's founders is the problem. Rushkoff may have altruistic notions about what Twitter might have been, but the owners of Twitter were not interested in that. They wanted a big payday and that's what they got. Stunned that a book whose central thesis is so flimsy is so well rated. The author has a very basic understanding of most topics covered and seemingly zero understanding of the rest. 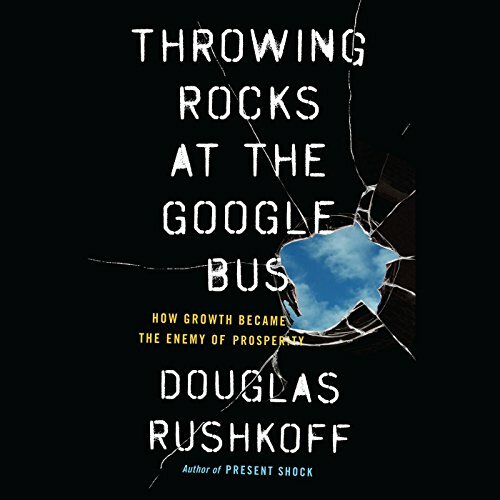 What made the experience of listening to Throwing Rocks at the Google Bus the most enjoyable? After listening to Harari (Homo Deus) which partly fed the paranoid part of my personality, Rushkoff provided a plausible future for humanity that was refreshing and gave a little boost to my faith. Nice to see someone's thoughts on how to change the economy or business in general. The voice performance could be better. Some parts were very dry. Absolutely amazing book, helped me see the economy from a different, more humanistic perspective, despise technology that monopolises and impoverished us with fancy "disruptor" hype. Will influence how I think about products I use, way I spend my day, and businesses I want to start. I wish every politician, economist and businessman reads it. I liked the book but..
the book was a little over my head for an audio book. I needed to take it slower which was something I didn't really want to do. I loved the stories he used to back up his information.